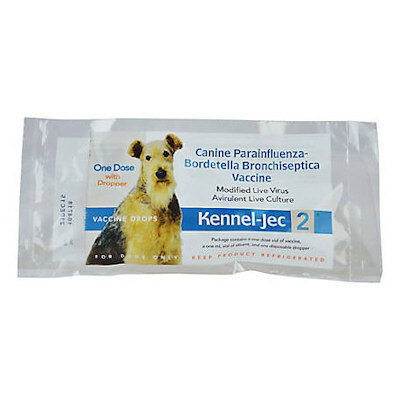 Kennel Jec 2 (Boehringer - Ingelheim) Canine Parainfluenza, Bordetalla Bronchiseptica Bacterin Single Dose Vaccine. Each dose comes with a nasal applicator. This is an Intranasal Only Vaccine. Caution: Do not inject this vaccine, it is intended to be given intranasally in puppies and dogs. Kennel - Jec 2 is for vaccination of healthy dogs and puppies at least 3 weeks of age as an aid in the reduction of Canine Upper Respiratory Infection. Puppies vaccinated between 3 to 6 weeks of age should be revaccinated at 6 weeks, then annually thereafter. Comes with nasal applicator and rehydration instructions. Note: The Syringe and Needle needed for rehydration is Not Included.